Any changes you make to the data set are not automatically picked up by the pivot table. 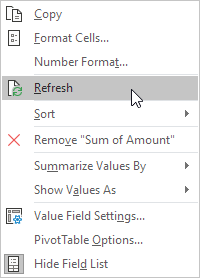 Refresh the pivot table or change the data source to update the pivot table with the applied changes. If you change any of the text or numbers in your data set, you need to refresh the pivot table. 2. Right click and click on Refresh. If you change the size of your data set by adding or deleting rows/columns, you need to update the source data for the pivot table. 2. On the Analyze tab, in the Data group, click Change Data Source. Tip: change your data set to a table before you insert a pivot table. This way your data source will be updated automatically when you add or delete rows/columns. This can save time. You still have to refresh though.